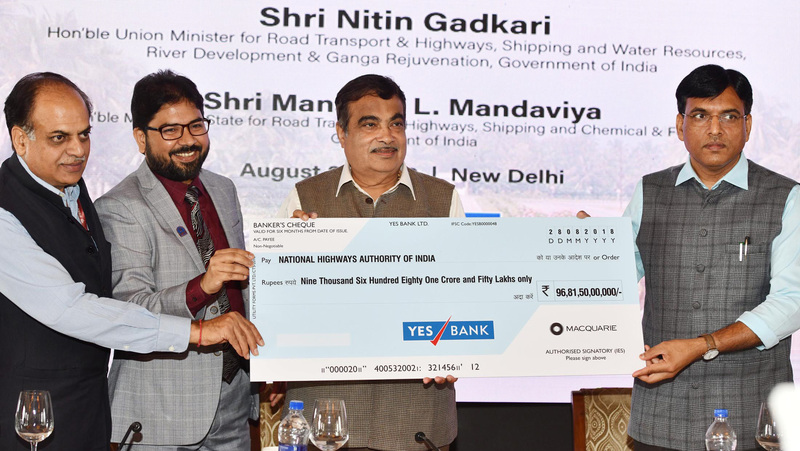 National Highways Authority of India did a financial closure of its first Toll-Operate-Transfer project with the India chief of Macquarie handing over a cheque for Rs 9,681.5 crore to Shri Nitin Gadkari, Minister of Road Transport & Highways, Shipping, Water Resources, River Development & Ganga Rejuvenation at an event in New Delhi today. This closure is the first for an asset recycling initiative by any government in India. NHAI has also called bids for second bundle of T-O-T for 586.55 km in Gujarat, Rajasthan, West Bengal and Bihar. Speaking on the occasion Shri Gadkari said, the government has taken initiatives to increase the investment in highways sector by almost four-fold since 2014. This year the government has allocated Rs, 71,000 crore for development of roads and highways in the country. The remaining funding requirements to meet ambitious plans are being managed through market borrowing and private sector investments. The Minister said, the second bundle of T-O-T has been offered and several more bundles will be offered in the months to come. He called upon the private investors to bid for these bundles, saying TOT is a risk-free model. He also invited investors to come up with more innovative investment models for the infrastructure sector. Exhorting investors for qualitative improvement, Shri Gadkari called upon the concessionaires to concentrate upon improving road safety, quality of maintenance and improving toll collection methods so that waiting time at toll plazas is cut down drastically..
Minister of State for Road Transport & Highways Shri Mansukh Lal Mandavia underlined government’s commitment towards providing good governance. He said, the government has increased budgetary support for infrastructure sector from nearly 1.5 lakh crore to almost 7 lakh crore. He, however, called for more public private partnership to enhance investment in the road sector. Road Transport & Highways Secretary Shri Yudhvir Singh Malik prioritised road safety and quality. He called upon the foreign investors to bring international practices in road development and safety. The first bundle of 9 projects, totalling approximately 681 KM of roads in two states of Andhra Pradesh and Gujarat, was awarded in 2018. Huge interest was shown by foreign investors. TOT Bundle-I was awarded to Macquarie for Rs. 9,681 Crore, which was 1.5 times the Authority’s estimate. The second bundle of over 586 kms is now offered spread over four States – Rajasthan, Gujarat, West Bengal and Bihar. The offer has 12 toll plazas across four highways.